For several years before the Babylonian captivity of the Southern Kingdom of Judah, the prophet Jeremiah uttered repeated warnings of judgment upon the wicked nation because of its egregious iniquity. The ‘bad figs’ element within that ancient nation, no doubt was the blame for the moral and political corruption that permeated every fiber of the national culture. Jeremiah spoke of those ‘bad figs’ and God’s on-going retribution upon them because of their sinister control and corrupting affect over the body politic. The wicked nature of the pre-captivity nation paled in comparison to the post captivity nation during the 400 years of the Intertestamental Period. 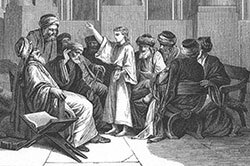 Both Biblical and secular history reveals the religious and political intrigue that was prevalent in the national leadership leading up to the time of Jesus. Then the Gospel writers recorded the verbal confrontations of the Pharisees with Jesus and His proclamation of the destruction of Jerusalem by the Romans. Download the charts and materials for the television series "Jerusalem on Trial"